Have you ever wondered what goes through a chicken’s mind? Wouldn’t it be helpful if they could say, “My feathers are itchy!” or “I’m bored!”? Though humans and hens don’t speak the same language, simple changes can help backyard flock conversations go smoothly. As backyard flock owners, we are tasked with becoming chicken whisperers. Keeping a peaceful flock requires us to interpret behaviors to decipher what our chickens are telling us. During fall and winter when chickens are spending more time in the coop, chicken boredom can bring out changes in behavior, such as pecking. Chickens are naturally inquisitive, but they don’t have arms and hands to inspect things. They use their beaks to explore instead. Pecking is a natural chicken behavior that allows them to check out their surroundings, including their flock mates. Though pecking is a natural occurrence, the nature of this chicken pecking behavior can change when birds spend more time inside. Understanding the difference between curious and aggressive chicken pecking is key to knowing when there is a problem. Not all pecking is bad. When it is gentle, this behavior is fun to watch. If pecking becomes aggressive, it can be problematic to other birds in the flock. 1. Investigate the reason for pecking. If the pecking chickens become aggressive, the first tip is to determine if something is causing birds to act out. Start with a list of questions about the environment: Are the hens too crowded? Do they ever run out of feed or water? Are they too hot or cold? Is there a predator in the area? Is there something outside of the coop that is causing them to be stressed? After the stressor has been identified, the next step is easy: remove the problem and the aggressive chicken pecking behavior may go away or diminish. To maintain this newfound peace, make sure your birds have a minimum of 4 square feet indoors and 10 square feet outdoors per bird. Adequate feeder and waterer space is also critical. Remember, there will always be some dominance in the flock as part of the pecking order. There are typically one or two boss hens who rule the roost. Once the pecking order is determined, the birds usually live together peacefully. The next step to prevent feather picking is to keep birds clean. Chickens take a different type of bath than you might expect. They often dig a shallow hole, loosen up all the dirt and then cover themselves in it. This process is called a dust bath. Dust bathing is an instinct that helps keep birds clean. On our farm, we make dust baths for our hens by following these three steps: 1. Find a container at least 12 inches deep, 15 inches wide and 24 inches long; 2. Combine an equal blend of sand, wood ash and natural soil; 3. Watch your birds roll around in the bath and clean themselves. Dust baths can also prevent external parasites such as mites and lice. 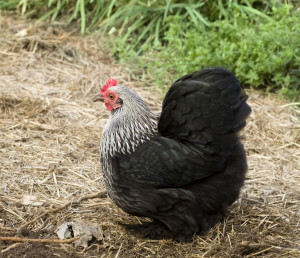 If external parasites are an issue, supplement your chicken dust baths with a cup or two of food-grade diatomaceous earth. If you add diatomaceous earth, be sure to mix it in well. Diatomaceous earth can be harmful if inhaled in large amounts. By mixing the diatomaceous earth into the dust bath, it has less probability to become airborne while still helping prevent external parasites. Next, provide birds something to keep their minds busy. Perhaps the most fun of these three tips is to find chicken toys that bring out their natural instincts. Interactive objects can make the coop more complex and exciting. Logs, sturdy branches or chicken swings are a few flock favorites. These toys provide unique retreats for hens who may be lower in the pecking order. Another flock boredom-buster is a block for hens to peck, like the Purina® Flock Block™. You can simply place this block in the coop for hens to peck. The block can be a fun experience for hens and prevent chicken boredom when they are spending more time in the coop. The Purina® Flock Block™ encourages natural pecking instincts. It also contains whole grains, amino acids, vitamins, minerals, and oyster shell to provide nutrients that contribute to the hen’s well-being. Want to find a Purina® Flock Block™ of your own? Find a retail location near you. This entry was posted on Wednesday, October 10th, 2018 at 11:10 am	and is filed under Uncategorized. You can follow any responses to this entry through the RSS 2.0 feed. Both comments and pings are currently closed.